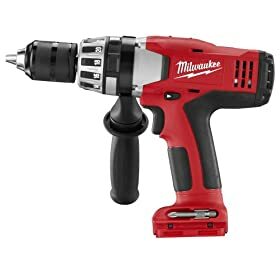 The Milwaukee 18-Volt Cordless Li-Ion 1/2-Inch Hammer Drill comes with a convenient storage case and is compatible with long-running 18-volt Li-Ion rechargeable batteries. Milwaukee 18-volt Li-Ion equipped tools provide up to 50-percent longer run times than 18-volt Ni-Cad equipped tools, while at the same time offering "fade-free" power until the battery is completely drained. The hammer drill comes standard with an all-metal, single-sleeve, ratcheting chuck with carbide jaws to prevent bits from falling out or slipping. A comfortable non-slip, soft-grip handle reduces vibration and fatigue, and the drill comes with a side handle for added drilling/driving stability. A high output motor provides 550 in./lbs. of torque, and the tool is backwards compatible with existing Milwaukee Ni-Cad 18-volt batteries. The driver comes backed with a manufacture's 5-year limited warranty. The battery and charger are sold separately. Cordless drill/driver, side handle, No. 2 Phillips bit, and user's manual. I purchased the Milwaukee 18 volt lithium 1/2" hammer drill kit and could not be happier. I had read excellent reviews about this item and they were all accurate. This thing is powerful and the batteries seem to stay charged forever. It's heavier than some cordless drills, but then it's so much more powerful. It has a metal chuck ( not plastic like the competition ) and the chuck jaws are carbide which helps grip the bit. I like it so much I bought a second drill body only to compliment the kit. I was never a fan of cordless tools, but Milwaukee has changed all that. I am a finish carpenter/ contractor and have used so many different cordless drills over the years (Dewalt, Ryobi, Makita). Every time they died on me I changed brands until I found this drill. I bought mine in a combo with the sawzall, and circular saw for $250 on sale. This drill performs far superior to all the others in every way. The most important are the strength and battery life/power. This drill keeps going through hot and cold conditions, and doesn't bog down as it gets to the end of it's cycle. This thing is great for drilling into concrete and hard woods. I have put mine through a lot and it shows no signs of ever stopping, or loss of power. The batteries last forever, and show you how much they have left on side. Also it can be used with ni cad or lithium batteries, and the lithium charger charges both. Also this drill may be a little heavy but it is built indestructable. I dropped mine off a 40ft roof onto the pavement, and it is fine. The bit it had in it broke and it got scratched up a bit, but the chuck is still straight, and the hard plastic body is still strong and in good shape! Other drills I have owned have broken from falling from a 7ft ladder (Dewalt). Milwaukee spares no expense on the quality of their tools. My favorite aspect of this drill is the chuck for two reasons. As stated in other reviews it is made of metal and carbide for a better grip on your bits, and durability. Also the chuck ratchets tight to whatever you put in it's jaws. The motor keeps the chuck locked in place when the drill is not in use so you don't have to tighten it with two hands, or by running the drill with your other hand on the chuck. I have never had the chuck slip on anything I have put in it, the ratchet really gets a great grip on the bit or driver. There are so many reasons to get this drill. Too many to write here. There is no doubt it is the strongest and best made drill on the market. It will be the last time you switch brands, that's for sure. I purchased the 824-20 (bare tool) here on Amazon, but the seller was bestcutleryandcookware and the price was $69.99 + $10 shipping. As soon as I made the purchase I noticed the retailer associated to this link changed and the price went up a few dollars. So I can only speak for my experience throught the retailer that sold me the drill. The drill was apparently from a larger set, so it did not come in the original packaging. It was brand new however and came with a user manual and the detachable handle. For $80, this is an incredible deal. The model has been discontinued, which doesn't make any difference to me other than driving down the price. I used to own a dewalt, and this drill is much higher quality. I can't believe I was able to buy this drill for the price I paid. It is one of my finest tools in my garage, and I have a lot. It has lots of torque and plenty of battery life. I love the chuck as well. It has a ratcheting mechanism that really locks down on the bit. I didn't know if I would use the hammer action that much but have used it quite a bit. Works great on concrete. I bought this as my primary cordless drill and so far I am overjoyed with it. Fantastic product. Great tool that I bought specifically to work with my older 18v batteries from Milwaukee. Very satisfied. Great product, glad that it is sold without the battery. I was able to replace my broken drill without the cost of expensive batteries I already had. Milwaukee 0824-20 18 volt cordless v18 Lithium-iom 1\2 inch Hammer Drill This isthe best Drill. I like lighter duty hammer drills like this one from Milwaukee as I can turn off the hammer action and just use it as a drill. With the heavy duty commercial hammer drills I can turn off the rotation but not the hammer action and for some drill bits the hammer action will quickly destroy the drill's cutting tips or even knock them off (as they are brazed onto the tool). The hammer action of this drill is adequate for small holes in masonry which is where we have used this drill. For large holes we have moved away from the TCT core drills to the laser welded dry cutting diamond core bits, like the ones from Blue Boar and Husqvarna, where no hammer action is needed or recommended. The drill is an excellent drill though a bit on the heavy side for extended overhead use (where a Makita is a better choice). The best feature of the drill is its ability to use old NiCads that I had from an older Milwaukee 18v drill. 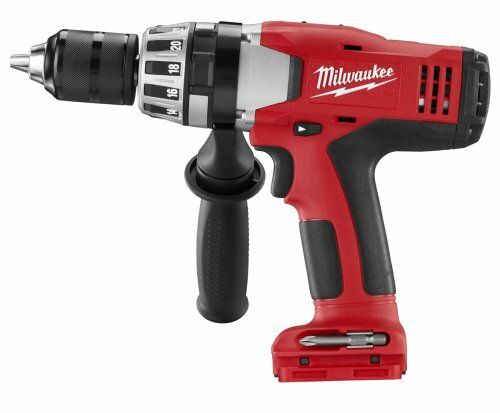 Milwaukee has recently started to sell its new "M series" lithium-ion cordless which are replacing the old "V series" drills like this one. The "V" drills work with either the V lithium-ion batteries or the old NiCad batteries, but the new "M" drills work only with the new "M" type lithium-ion batteries. Over time it will become more difficult to find the "V" batteries as this was a pretty short model run by Milwaukee. Anyone buying a drill they want to be able to use and get new batteries for over the next 5-10 years would be better off getting the M18 or another brand that is more stable in this regard. One aspect of this drill that is much better over the new M18 is the design of the second handle which can be positioned (like the DeWalt XRP) anywhere in a 360 degree arc. The new M18 side handle has to be 90 degrees, left or right side, to the drill handle is quite a bit more limiting. A nice aspect of the new Milwaukee M18 lithium-ion drills is that there are 2 different sizes of power packs so a lighter one can be used by many people who will not need the amps of the full pack and have a lighter drill to work with and the recharge times are half as long for the smaller battery packs. Something that is a little curious is that the Makita lithium-ion battery packs charge in 15 minutes while the small Milwaukee M-type battery packs take 30 minutes and the large battery packs take over an hour to charge. For most people the full kit will be a better deal but if you have an old Milwaukee 18v NiCad drill and want to gradually ease into lithium-ion this would on the surface seem like a good approach. Unfortunately with the new M-type drills that will not work with either Milwaukee Ni-Cad or Milwaukee V-type lithium ion batteries, this drill is a bit of a dead end and a dubious investment over the long run. Having been bit in the past by manufacturers that stopped producing batteries for early NiCad drivers and drills I am now much more cautious and want to verify the easy availability of replacement batteries (at local stores) before making a purchase decision. Whether Makita products are better or not is up for debate but their replacement batteries have the widest distribution of any manufacturer which should be a consideration. If you are chucking your old NiCad batteries there are places including Home Depot that have recycling bins which keeps the deadly cadmium out of local landfills and the water supply.